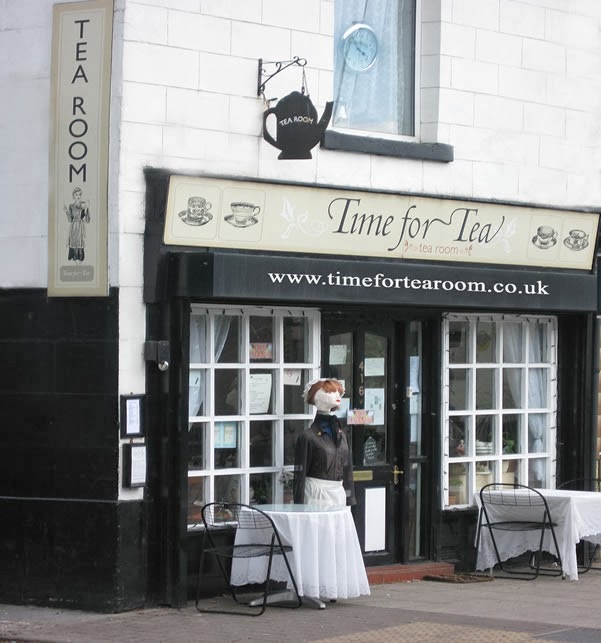 Time for tea is such a haven. As soon as you’re through the doors, you forget the business of the day and the hectic traffic that makes its way through Prestwich toward Manchester or to the nearby motorway junction. It’s all white tablecloths, china tea services and delicious food. I went there again recently because I was too late to get lunch from the office canteen and all the books I needed to write a lecture were in my study at home. Time for Tea made a welcome hiatus between routine admin and something more creative. “They grumble I’m too expensive,” said owner, Julie. But she isn’t. I had a good portion of home-made broth with homemade bread, a pot of tea and a slice of Victoria sponge, all for £5.69. I spent a good hour and half in there and didn’t outstay my welcome. It’s probably just looks expensive because of the linen, lace and china. Whenever I go there, alone, I get talking to Julie and to some of the other customers. This time I met someone involved in the University of the Third Age. I guess I’ll get into that when I retire in three years’ time. “I’m starting a philosophy course soon,” he said. Now that does sound promising. Time for Tea justifies itself as a creative café because it holds book events, literary salons (yours truly has held one there), has books on show and promotes events at other venues. Definitely worth a visit.